Can make whatever font or artwork in polyfoam (or EPS Foam) according to the customer's request or customization. Very convenient. The ready-made decoration materials in the market might not suit every individual's needs. Wedding decorations add much character to your wedding celebration. A good decorator is able to design the wedding venue to the mood and style that you envision. Simple decorations start from RM1k+. If under budget, decorate only a section of the wedding such as a photobooth, dessert table, photo display corner, stage, or dining table and make it as outstanding as possible. Here is a list of decorators, their contact info and reviews. Many of them are able to customize the decor according to your budget and requirements. Any comments about the decorators girls and boys? JW Design Wedding Decoration | Taman Berkeley, Klang | FB Page | 016 2779341 - Nov 17: Love it! Very creative, kind and honest vendor. Memories de Wedding | memoriesdewedding.com | Taman Tan Yew Lai, KL | 012-219 2336 - Jan 18: Engaged Memories de Wedding for our wedding decor and no regrets at all. Everything was just as what I wanted. MyFlowers House | 8 Avenue, PJ | carrine.blogspot.com | fb.com/MyFlowersHouse | carrine93@hotmail.com | 012-538 9316 - decorator and florist. Purple Romance Event | purpleromance.com.my | FB Page | KL | 018-919 3911 - decorations, photobooth, stage, instant print service, love corner, VIP centerpieces, etc. Wishing Tree | wishingtree.com.my | Sungai Besi, KL | 03-9055 4611 - Mar 16: the flowers and decoration were so beautiful and lovely for our wedding. Even though we planned our wedding from abroad, they were quick to respond. MAHA Events & Decor by Femina Bridal | fb.com/mahaevents | jalan 52, PJ | 016-252 9142 - May 18: Appreciate your efforts, Mr Nathan and team. decor was beautiful and exactly what we asked for. KL Wedding Ministry | Seri Kembangan | fb.com/klweddingministry | klweddingministry@gmail.com | 016-445 0538 - dekorasi meja makan beradap, majlis pertunangan, perkahwinan. Sep 17: turned a drab seminar room into a wondrous soft and dreamy solemnisation venue. Mazzo Di Fiore | mazzodifiore.wordpress.com | JB - Weddings, Events, flowers, etc. Hearvea Wedding | FB Page | 017-799 3499 - Sep 16: Perfect pelamin cantik, responsive. tepati janji. tak ada baju pengantin. Tak banyak peralatan. decor tidak boleh terlalu complicated. Figstreet | figstreet.blogspot.sg - Jul 12: Their concepts are very unique and extremely Indonesian Chinese style. Alpha Event Planner | alphaeventplanner.com | 012-486 5895 - planning, decor, canopy, photography, flowers, balloons. Cherish Events and Weddings | haidehooi.com | Ipoh | 05-547 6619 - Jan 18: Calculative. May 16: garden wedding decoration done by Cherish, absolutely marvelous. Dec 11: The venue has been transformed according to the theme. Haide Hooi, started off as a florist 15 years ago. Her floral arrangements are exceptional. Kisha Mega Events | kishamegaevents.blogspot.com | 010-564 5411 | Kedah, Penang, Perak - Wedding decoration, theme, event management, sound system, etc. May 18: Professional and awesome team. Always gives more and required, just to make the event successful. Gana Creations - FB Page | ganasriiya@gmail.com - Hindu/ Indian Wedding, modern, Western decor, mandap, etc. Kerongsang Emas | kerongsangemas.blogspot.com - Apr 12: One of my friends kahwin and ambil khidmat dari mereka. That time tengok, the jobs really make me awe. The price not so budget la but u will be fully satisfied. Mentari Kreatif | fb.com/mentari.kreatif | Taman Lagenda | 012-670 3855 - Sep 16: pelamin cantik terperanjat. Can make whatever font or artwork in polyfoam (or EPS Foam) according to the customer's request. The ready-made decoration materials in the market might not suit every individual's needs. Weddings by Events Horizon | eventshorizonweddings.com | Kuching - Jan 14: pulled it off perfectly. 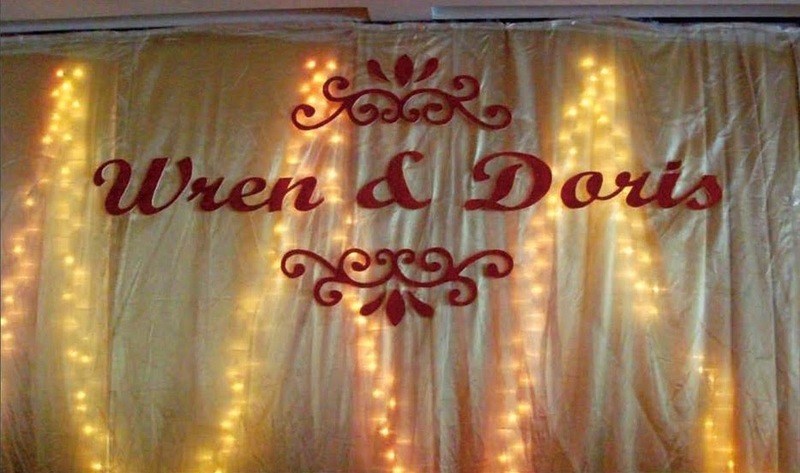 Wedding decoration was awesome. Kisha Mega Events | kishamegaevents.blogspot.com - Wedding decoration, theme, event management, sound system, etc. Hi I had engaged service from belle notes. You can check it out more about their service. I will post up some comment when we have more discussion or after the wedding end. Thank you. Interested with the belle notes decor as well. How's the event turns out on your big day? Can share? 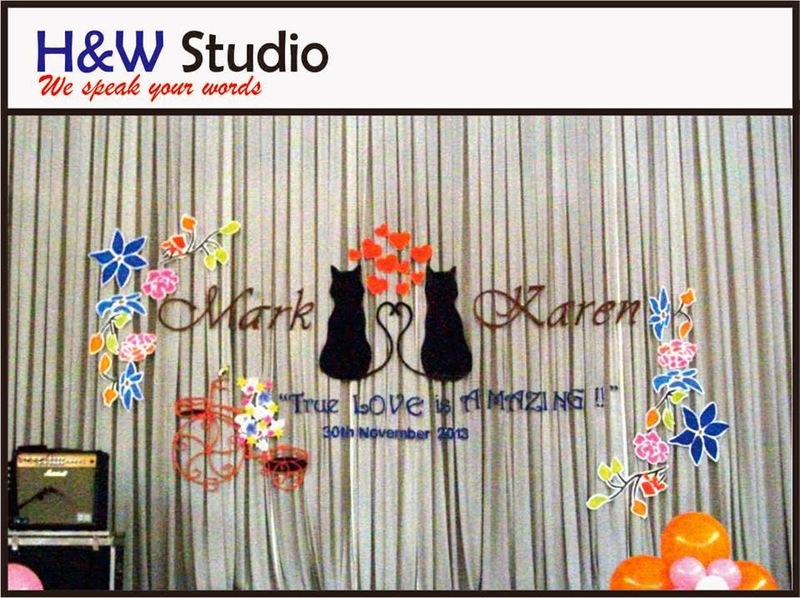 H&W is giving away 5 sets of wedding backdrop (wordings). However it's only eligible for couples whose weddings are in Nov or Dec 2013. Share this promotion to your friends! try out A&E https://www.facebook.com/aekl.co https://www.facebook.com/weekendiminlove! very honest, talented and professional team! Heard that their service is bad. Not sincere to deal with couple. Think twice before appoint them. 被Bellx Noxx Facebook 里美美的照片吸引着，跑去定Bellx Noxx. Hi. Just to inform that I went to Story Book at Tropicana City Mall last weekend. The shop is closed and empty inside. I used Moments.my for my wedding decoration and they did an absolutely amazing job. They helped set up the garden ceremony, the dessert bar as well as my memory corners, stage and ballroom decor as well. My Photo Booth was also done by Goh Kel Li from Visual Storytelling (Nigel Sia). I can't find a suitable category. I would also like to introduce my Dessert vendor. Decoration was done by my decorator but Melting Moments by Kah Yie concocts the most delicious dessert, as commented by my guests. I had macarons, biscotti and rocky road marshmallows and the last two are pretty unique desserts at a wedding and that was a big hit with my guests. I also had The Mad Alchemy serving coffee to my guests. Hi, not much info about MemoriesDeWedding in this website? FB search : "Memories DeWedding"
Any portfolio to view more of the work?